In the 1990s, there was only one cricket team that mattered. They were a group of strong, talented, ruthless players who were head and shoulders above everyone else. Every other team wanted to beat them and secretly perhaps, wanted to be them. Your worth as a cricketer was measured by your performance against them and you were said to transition from ‘boys’ to ‘men’ when you played against them in their den. It was a sign of greatness to do well against them, and to be named in a Dream XI alongside them was an honour. No matter if the world hailed you as a star batsman or a world-class bowler, endorsement from them meant more, felt much more. Other teams had players who could perform and stars who could perform consistently. But this team, defined alternatively as “monsters”, “machines”, and “greats” was a team of superstars who never stopped coming at you. That team was Team Australia. Organised for the movie ‘83, a recent event that brought together World Cup-winning players from the 1983 Indian cricket team offered an insight into what it really feels to be an underdog. Nobody gave them an iota of a chance. Nobody knew them and despite the fact that India had been a Test-playing nation with many greats, there seemed to be no place for them on the world cricketing map. In honest interviews with many of the players, one thing was common — the lack of expectations from them. Most were given the advice to consider the tournament as a paid holiday where you also happen to play cricket on the side! In fact, in a hilarious interview by the inimitable Kris Srikkanth, he said: “Our ticket was from Mumbai to New York via a stopover in London to play.” So hopeless and hapless was this bunch that the tournament in England was meant to be a stopover for them. Their plan was to holiday in the US with a stopover in England — it would be a belated honeymoon for the opener who had got married earlier that year. Indian test teams that toured Australia in the past two decades were similar. For the wildest cricket fan, including yours truly (an eternal optimist), beating Australia in Australia in Test cricket was out of question. Sure, you could dent Australia’s big win; sure, you could avoid a whitewash; sure, you could show character by drawing or winning one match. But win the series? You must be joking! Of course, there were memories. You break into a smile even now when you see an old video of Ishant Sharma running in to make Ricky Ponting hop and dance before getting him out. You can only marvel at Virender Sehwag’s unbelievable innings of 195 in Melbourne where he almost got to a double century in a day and you must stand up and applaud the mental strength of the great Sachin Tendulkar who blocked out the square drive from his repertoire of shots and was determined to not get out en route his 241* in a Boxing Day Test. But these were fleeting moments. Sharma’s spell was fiery because the great Ponting was “set up”. Sehwag was an outlier because the pace trio of Lee, Bracken and Williams and the spin of MacGill and Katich didn’t matter. Tendulkar’s innings was unbelievable because it was quality batting against a bowling line-up of Lee and Gillespie and he not only scored a double hundred, he did that without hitting a square drive. It is almost as if the opponent’s size made your contribution seem bigger. Hence, ‘historic’ is an understatement to define India’s first-ever Test series win in 71 years in and against Australia. 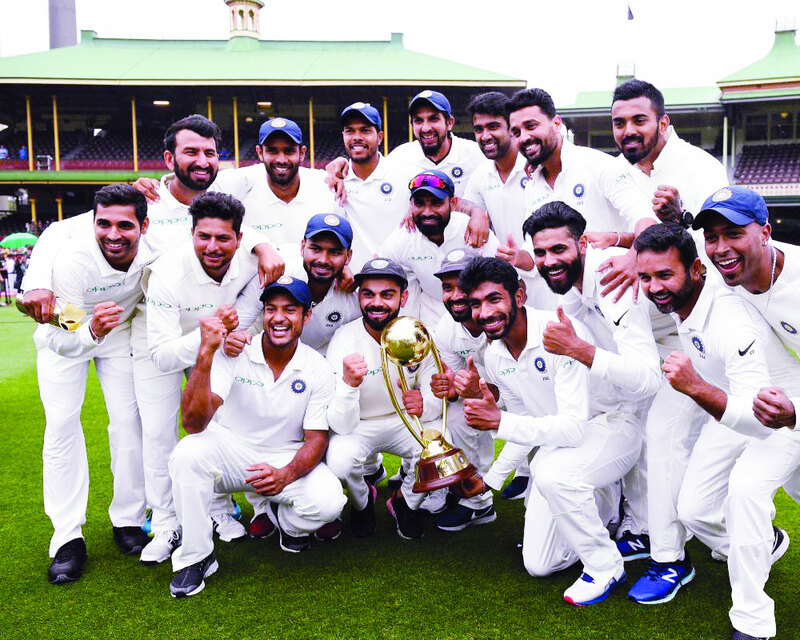 The effervescent Harsha Bhogle could not help but sound like a fanboy when he tweeted, “If like me you have been coming to Australia since 1991 with no hope of winning a series, then this is a huge moment. India are now the first Asian team to win a series in Australia. And it feels wonderful to be able to say it.” Perhaps not even the players understand the magnitude of what they have achieved. Not just yet. If you see grainy videos from the past where Tendulkar has scored a 100 and ended up on the losing side, or a Sourav Ganguly, where he speaks to the master of ceremonies after losing a match, or in recent years, MS Dhoni speaking at the post-match press conference after losing a close encounter, all of them will say the same things — they would always chose a team victory over a personal milestone; the team can be a world-beater if it plays up to its potential; and the score line doesn’t do justice to the battle on ground. The anguish and longing in these interviews stand out. And thus, to be able to break the jinx, and to have delivered when it mattered, means the world. As important as it is to hail the new superheroes of world cricket, it is equally important to quash questionable comments by cricket watchers that seem to dent the achievement. I mean, sure, this is a democracy and there is freedom of expression, you can say what you feel but where all semblance of sense is thrown out of the window, the cricket fan in me turns into the big green Hulk ready to smash. The top three arguments that are thrown around the most include: This is the best Indian team ever to defeat the worst Australian team ever; the current Aussie attack doesn’t measure up to McGrath-Gillespie-Warne trio; but we still have to win in South Africa. And whose fault is it? Australian past greats, commentators, cricket experts and anybody who understands English is keen to thump a fact in our faces that Smith and Warner, the two Australian stars who are currently not allowed to play international cricket, on an average score 40 per cent of all runs that the team scores. In their absence, they assert, there is nobody who can take their place. India, on the other hand, they are quick to point, boasts of a cricket team that has always enjoyed strong batting and was likely to outscore Australia. If there was ever a measuring scale for accounting for absurdity, strange would be the base. It would go up to absurdity and this argument would be at the top. As Sunil Gavaskar has painstakingly pointed out many times, Australians are not great losers. They take their own sweet time to swallow defeat. The same Indian team that these experts claim to have had great batting was the one whose form and lack of experience was repeatedly questioned. To use another one of his recent statements, it isn’t the fault of the Indian cricket team that Steve Smith and David Warner are missing. The playing XI for any team are the 11 best players that can represent the nation at that particular time. If India visited Australia without Tendulkar and Kumble, would that be reason enough to accept our defeat? I am yet to come across a more irritating question in the history of cricket analysis. If Kohli scores at the pace he does, it is because modern cricket doesn’t have enough quality bowlers. He never faced the likes of Akram and McGrath and Donald at their peak. If we discuss Sachin Tendulkar’s God-like longevity and consistency, we are immediately reminded of the fact that he had it easy. There were no uncovered pitches and the fearsome pace quartet of the West Indies that only Sunil Gavaskar was able to negotiate. This argument doesn’t make any sense from either side of the table. If we look at history and compare them to modern-day greats, then we are no different from that video game in Rocky Balboa (Rocky VI) where a young Rocky, the original Italian Stallion, is matched to compete against the young Mason ‘The Line’ Dixon. While in the movie, the board did give permission to Rocky to compete and settle “the fire in the basement”, it is unlikely that we are going to see Michael Holding leave the commentator chair to deliver some sweet chin music to Kohli & Co. Frankly, I did see Courtney Walsh and Allan Donald try that in Cricket All-Stars in 2015 and it wasn’t pretty. Alternatively, if I do agree that modern-day cricket is only for the batsman, then there would simply be more batsman with 50+ average in Test cricket. Again, to borrow from Mr Gavaskar, even if the ball bowled is bad, it still needs to be hit to the boundary. We will have to accept that the only real comparison that can be made for a cricketer of a particular generation is from that generation. What’s the point of comparing past greats with the current ones when you can’t have them compete? And what’s wrong with that? We will cross the bridge when we get there. Think where did Indian cricket stand before this tour of Australia? Or even after the first Test, which India lost? The captaincy was questioned. His form (or the lack of it) was the highlight. The opening pair was criticised. We were thought of as one bowler short. We didn’t know whether we needed the experience of R Ashwin or the rawness of Kuldeep Yadav. We didn’t know whether our wicket-keeper would be able to deal with the pressure. We had practically no middle-order batsman to write home about. We were a team that hadn’t won any series in Australia in over seven decades. And look where we stand now. We have a young bunch of players who are not afraid to take the battle to the opponent, we have a bowling unit that has the spice of space and the guile of spin in equal measure. We have a wicket-keeper who is being seen as the next Gilchrist. We have the next Mr Dependable after Rahul Dravid in Cheteshwar Pujara. We have debutants who are ready for the grind of world cricket. When did we feel this last? It’s taken a long time coming. India has achieved something remarkable in Australia this season. Cherish it. Soak it in. Savour it. It took 70 years coming and is a sign of greater things to come.